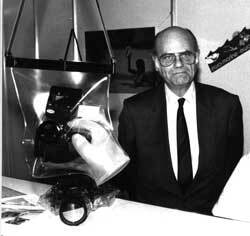 Mr Hans J. Goedeck, our CEO from 1949 until 1998 and inventor of the flexible housing, at the Photokina trade show in Cologne in 1986. On the beach with ewa-marine in the 1970s. The history of ewa-marine can surely be seen as an integral part of the development of underwater photography and film from the 1960's up to today and into the future. Our company was founded in 1947 in Tutzing near lake Starnberger not far from Munich in Germany under the name of "Goedecke GmbH & CO". (GmbH being the German equivalent for a Ltd. company). It used to be in the textile manufacturing business and to produce ladies´ and gents´ fashion for the German market. Everything started right after the war and before the DM, the German Mark, was introduced, with old military, war surplus, silk parachutes, that were being used to manufacture lady blouses for a prominent Munich chain of department stores. In the 60´s, while cheap production plants were opening around the world, the end of textile manufacturing in Germany was beginning to loom: Goedecke GmbH & CO also seemed to be at stake. In 1969, however, Mr Goedecke, who was an avid amateur photographer as well as a water sports fan, came up with the idea of a flexible housing to protect his camera from salt water and sand. The first flexible ewa-marine underwater housing was born. Photography industry then became the company´s core market. After we introduced the first range of products at Photokina in 1970, this range grew quickly to cover a wide spectrum of products for super-8 cameras, like mechanical title generators and camera gloves for instance. However, the demise of this kind of camera which can now be found in our museum, led to the end of this range of products, which is why the company decided to focus on underwater camera housings. The fact that the company´s name was then changed from "Goedecke GmbH & CO" to "ewa-marine", which only used to stand for the underwater range, represents symbolically the company´s new orientation. Our knowledge of technically sensitive production methods using high frequency film welding machines enabled us to develop a great variety of other products such as waterproof covers or flexible containers for technical devices. "Ewa-marine" therefore became a renowned and recognised specialist in this domain. The end of the textile manufacturing range had also marked the end of our implantation in Tutzing. Our products, which had conquered the world under the label name "ewa" were then manufactured in Ottobrunn at the Goedecke company and by a close supplier, Mr. Striteski. By 1989, the premises in Ottobrunn had become definetely too small and the company moved into a new building at 9 Liebigstrasse in Kirchheim by Munich. In 1998 a substantial change came for ewa-marine. After seeking for successors for his company during a long time, Mr. Goedecke finally found them. On December 16th of 1998, the contract was signed and Mrs. Giselheid Schmidt and Mr. Christian Schmidt became from the 1st January 1999 the two new shareholders of "ewa-marine". As if it had not been enough, on January 1st 1999, ewa-marine changed its entire bookkeeping and the entire exchange to the new euro and was thus one of the very first companies which took this decision, thereby clearly showing how confident it is in Europe´s and in its own future. After a phase of consolidation, ewa-marine started to grow again and the need for more space soon became a priority. Accordingly, we moved again on November 1st 2003 to our new location in Geretsried at 17 Blumenstrasse. Thanks to our new location and our stream lined name "ewa-marine GmbH", which is even better adapted to emphathize our core business, we were from then on looking forward to a new phase of growth which would be in the interest of ewa-marines customers and associates as well. On the 1st October 2014 we moved once more, this time to Hans-Urmiller-Ring 12, in Wolfratshausen, just 2 miles "down the road" from the previous factory. The new premises were selected mainly for environmental reasons. Thanks to the modern and considerably better isolation, we were able to reduce drastically our carbon-footprint during the winter, heating months. All our products have since then been manufactured in our plant in Wolfratshausen according to an elaborate process, where they are then tested, packed and sent out to the national and international market.